Gov. 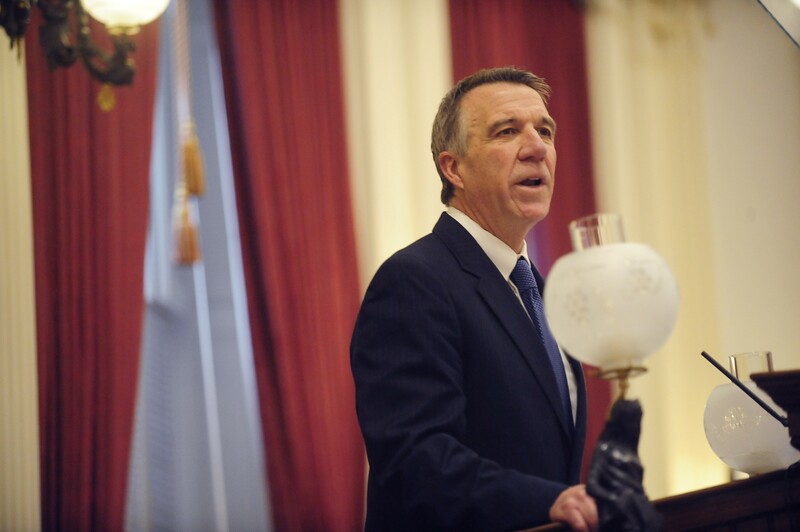 Phil Scott gives his budget address Tuesday. When Republican Gov. Phil Scott released his budget on Tuesday, the immediate response was skepticism, particularly concerning his education plan. His calls for boosting early education, child care and higher education drew positive reviews. But his funding plan, which would raid the education fund to pay for those improvements, force local school boards to level-fund their budgets, and make public school employees pay more for health insurance, was seen as politically untenable. It didn’t help that Administration Secretary Susanne Young framed the plan as a non-negotiable “package” requiring urgent action by the legislature. By Thursday, the objections were multiplying. And they went beyond policy choices, to areas like accuracy, feasibility, legality and even constitutionality. At day’s end, the plan’s supporters were furiously retrenching. Instead of advocating for passage, they pleaded for a modicum of consideration by the majority Democrat legislature. For sure, there was plenty of conversation. But almost all of it was negative. The deadliest criticism came from a nonpartisan source: analyst Mark Perrault* of the legislature’s Joint Fiscal Office. He circulated a two-page printout highlighting the problems with the Scott education plan, starting with simple math. The Scott plan would provide new money for early and higher education by dipping into the education fund, which is currently devoted to K-12 education. The administration says it would replenish the ed fund with general fund dollars. Not so, says Perrault. He says the Scott plan adds $135.9 million in new expenses to the ed fund, while providing only $86 million from the general fund. The ed fund would be shorted by nearly $50 million. And its obligations to early and higher education are slated to grow in ensuing years. There was talk of potentially devastating impacts if small schools are barred from increasing their budgets. “What if the furnace breaks or the roof starts leaking?” Cummings wondered. And there’s a crushing, compound irony buried in the plan. While its backers tout the need for immediate property tax relief, the Scott plan doesn’t actually provide any. In fact, property tax bills would rise for some Vermonters, including those who are cash-poor but property-rich. Senior citizens, for instance. The projected savings from the mandated level-funding of local school budgets wouldn’t be used to lower property tax bills; they’d be spent on Scott’s favored programs. Savings from increased health insurance premiums for teachers would be siphoned into the general fund. Every morning, lawmakers can pick up a copy of the Barre-Montpelier Times Argus in the Statehouse coat room. They were greeted on Wednesday by an editorial entitled “Budget Voodoo,” which said the Scott budget was “built on a fantasy” and judged his approach to the budget “naive.” Which is a hell of a thing to say about a guy who’s been in state elective office since 2002. Legislative leaders will certainly continue to take testimony and do their due diligence. Many say they intend to take their duty seriously and give the new governor a chance. But there is no doubt that Scott’s plan is going nowhere. In fact, the real question isn’t whether his plan will survive; it’s how much damage his political clout will suffer because of the crash-and-burn failure of his first major initiative. *Correction, January 27, 2017: A previous version of this story misidentified Mark Perrault.